Cycling around this area is a delight & even when it’s overcast (like today) it is a perfect way to spend a few hours. 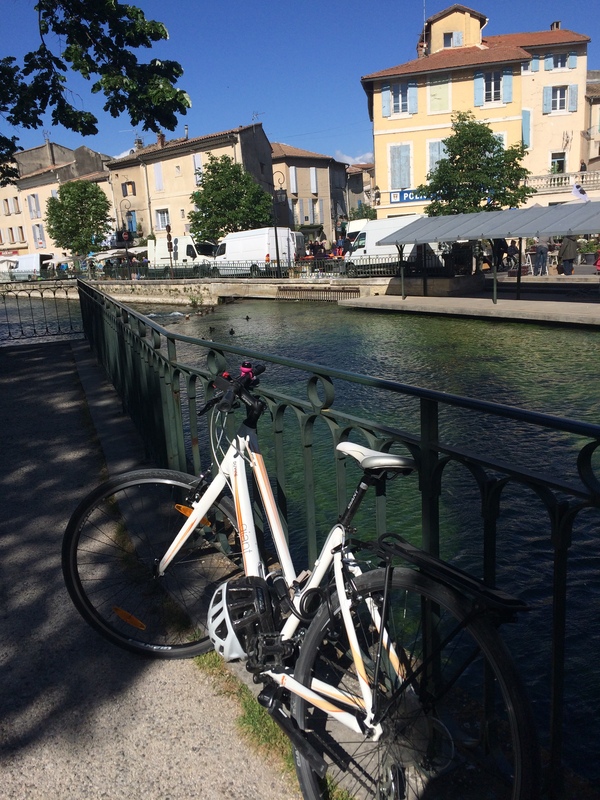 After an early wake-up I thought I’d hop on the bike & head across to the lovely Thursday market at L’Isle Sur La Sorgue aiming to arrive for mid-morning coffee. For once (and I know Andy & the boys will find it hard to believe) I changed my mind when I saw Goult on the hill just off the Veloroute du Calavon. I remembered that the Boulangerie there does the most wonderful Fig & Raisin bread on a Thursday, which also happens to be its market day. So, abandoning my original plans I turned off at Lumières & headed up the hill to the village. In the height of summer the village is packed with people & the stalls line either side of the Main Street & fill the square in front of the Church. It’s also hit & miss whether you can find a seat for coffee at the Café de la Poste, which is a nice place to sit and watch the world pass by. 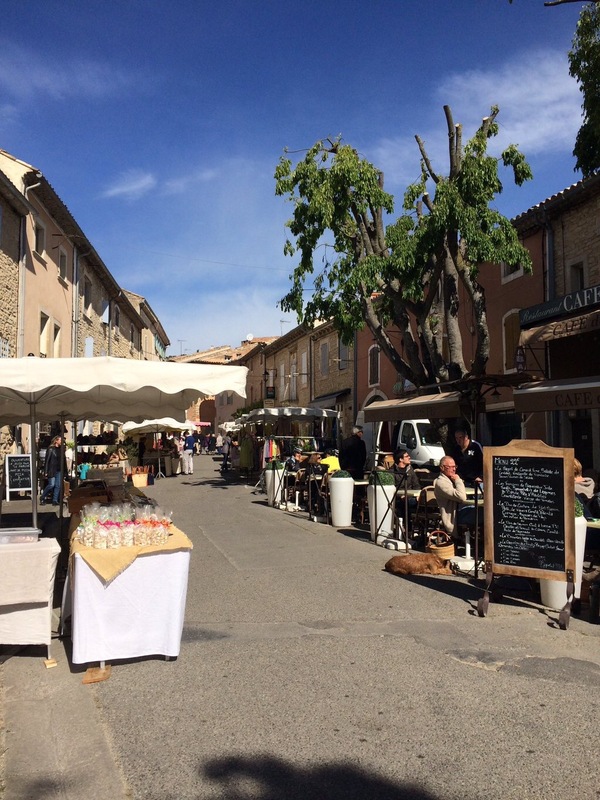 Today though the village had calmed and had a gentle feel to it, with the market fitting comfortably into the square. Gone we’re the stalls selling light linen dresses, replaced by others selling scarves (a must-have accessory in France). This has to be a purchase for Andy !! 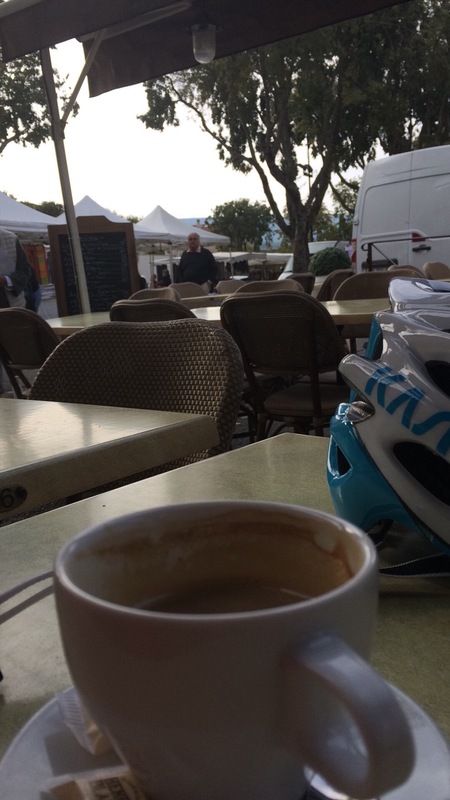 There was no queue at the boulangerie & the lady had time to chat (about how quiet it is now, describing the summer as ‘bizarre’) and even better there were just a handful of chairs occupied at the Café, so I could sit and have a much needed drink. I certainly felt slightly under-dressed as I sat with my coffee. Most of the people around me were wearing jumpers,coats and scarves, whereas I was sitting comfortably in my cycle shorts! Not sure it was cold enough for sheepskin ! 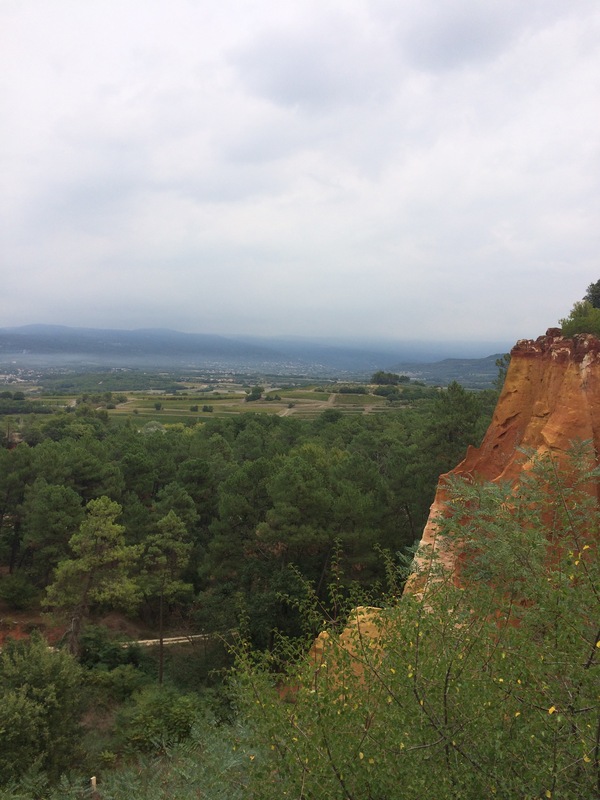 From there I headed across to Roussillon (another local Thursday morning market), taking a road that bizarrely I have never cycled along before, which brought me into the village through a pretty Pine woodland growing from the bright ochre soil. 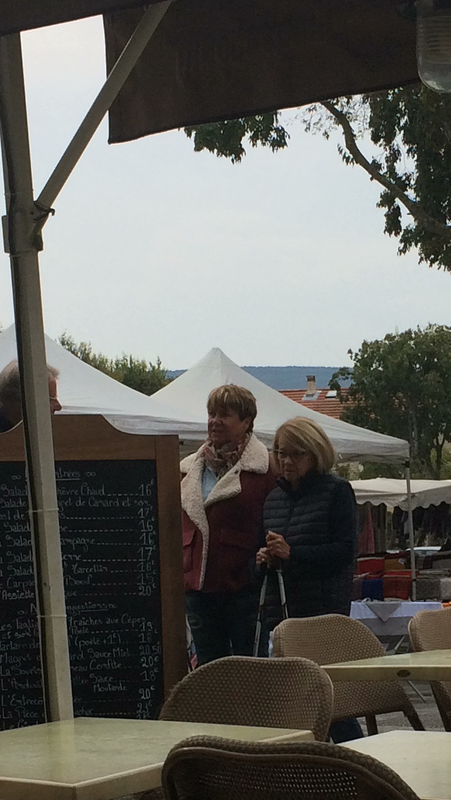 Roussillon market again was lovely and quiet, a far cry from the queues and busy-ness of the height of season. So I took a few minutes to sit with another coffee overlooking the view across the Ochre cliffs & the valley towards Saint Saturnin, being entertained by the singer who had set up nearby. 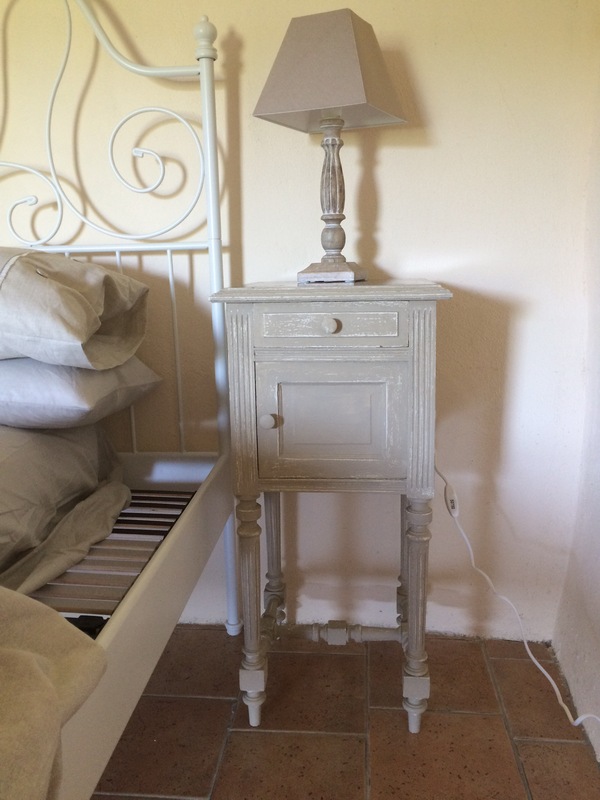 All in all a very chilled-out morning, before heading back to the house to get on with some work……..
Whilst we were here this summer we spent hours pottering around Vide Greniers and Brocante markets buying pieces of junk (sorry furniture) for the house. Many of the pieces need to be painted and it was just too hot to get on with it in the height of summer, as the paint dried on the brush before it could be applied to the wood! One of the pieces I managed to get done before the weather became too hot! 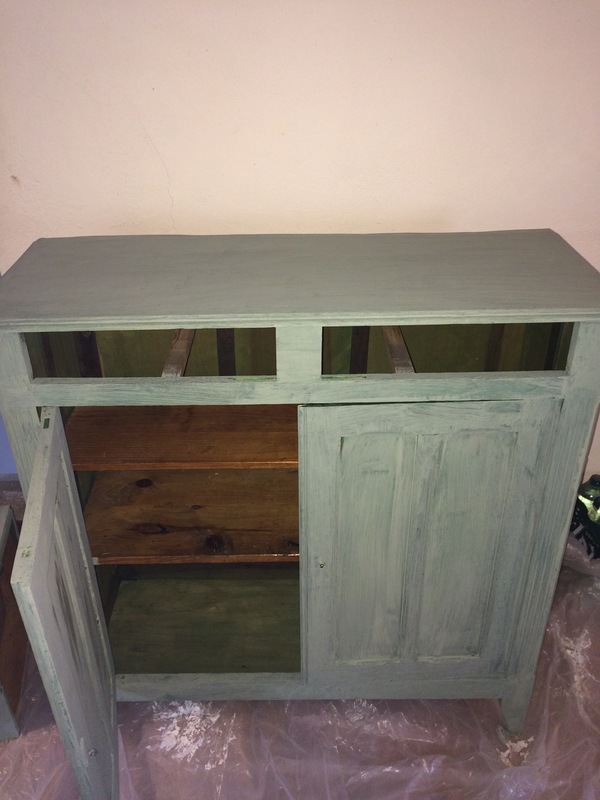 So this afternoon I knuckled down & got back to the painting, starting on a useful & rather pretty cupboard I had bought from the local recycling centre for just over 20€. 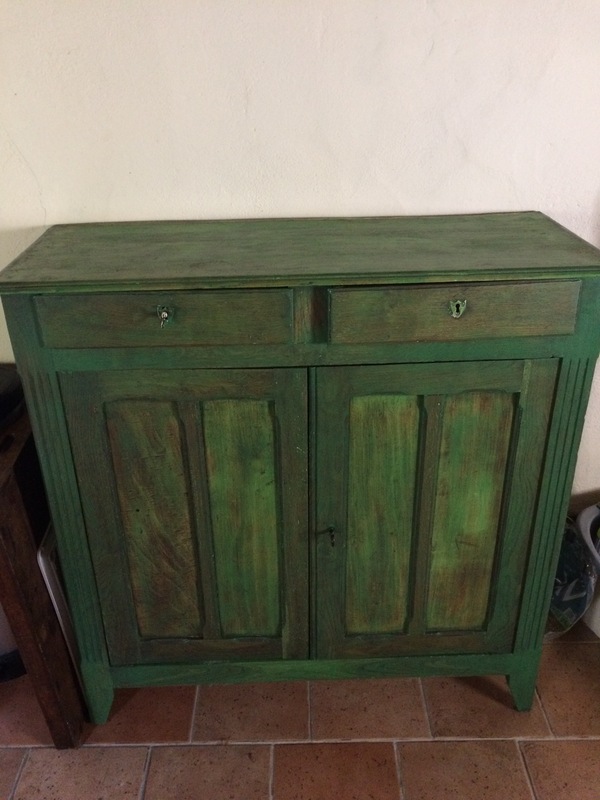 For some reason the shiny green finish really didn’t sit comfortably with the rest of our (already painted) kitchen furniture! After emptying it – (just how did we accumulate so much stuff in such a short time!) -I set to work with the sugar soap and managed to get a couple of coats of the base colour on before supper, which was a good start & means I can get on again this evening. 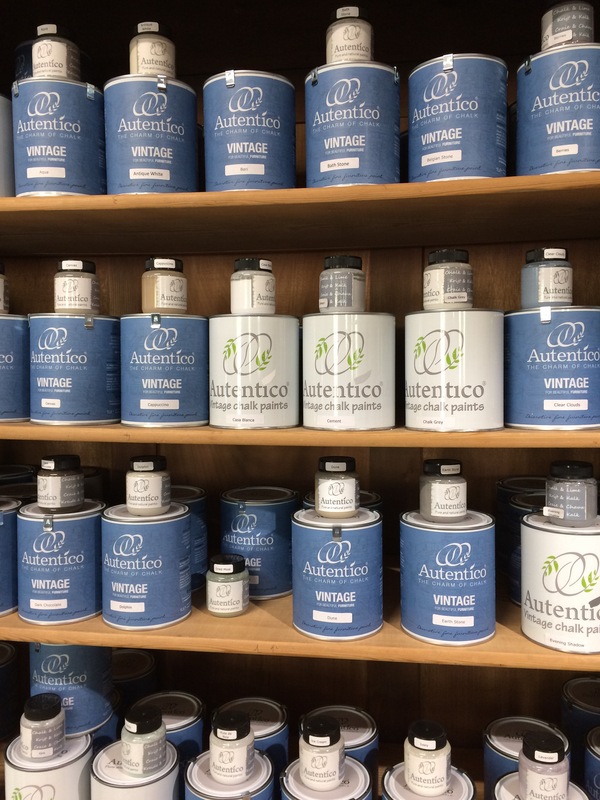 The good thing is that I’ve found a local supplier of ‘Autentico’, which is by far my favourite chalk paint to use, so had popped there yesterday to stock up on the colours I knew I’d need. So I had no excuse today! 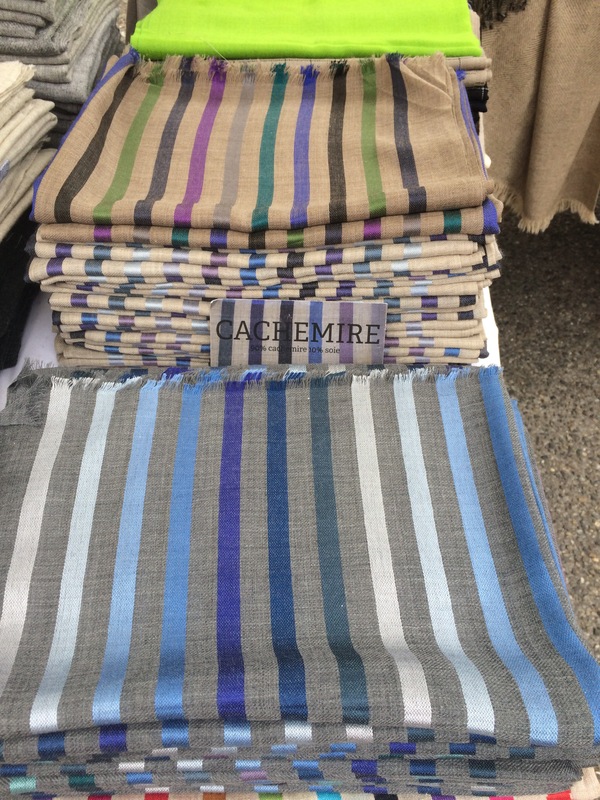 Decisions, decisions – so many beautiful colours at the Autentico supplier’s in Brillanne. It’s funny but I think I’m busier when I’m here than I am back in the UK – I certainly don’t have any time to get bored or feel lonely (Skype has really helped with that) & have never found myself wondering what to do next! All I can say is bring on tomorrow……..
Next Post Out with the old & in with the new – cheerio ‘Growler’! It’s certainly cold enough for sheepskin here today. Lovely post, thank you for sharing. That’s just the kind of busker I like – one without any amplification! Must admit it was a very pleasant way to pass a few hours ! On the subject of weather in the U.K. – just spoken to Andy & the fire is lit and they’re having roast turkey for tea! !